UPDATE: PILOT Max Quartermain is reportedly one of the five people killed in the worst aviation accident in 30 years in Victoria today. Mr Quartermain owns Essendon-based Corporate and Leisure Aviation and has more than 38 years of experience. ABC News this afternoon reported it had confirmed Mr Quartermain was the pilot killed when a five-person Beechcraft charter plane experienced engine failure, dipped dramatically and cartwheeled into a factory outlet in Victorian suburb of Essendon shortly after taking off at 9am this morning. Before crashing into the DFO building adjacent to Essendon Airport, Mr Quartermain is believed to have made two mayday calls. Investigators who arrived at the scene on Tuesday will examine closely the site and wreckage, gathering recorded data including radio and radar, and interviewing witnesses. The pilot's distress call is expected to form a significant part of the investigation, police assistant commissioner Stephen Leane said. Authorities are yet to confirm details of fatalities including the identity and nationality of who was on the plane. Thehe Herald Sun also cited aviation sources paying tribute to Mr Quartermain, who they believe was piloting the plane when it went down. 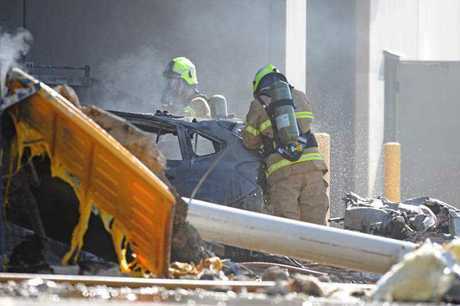 EARLIER: FIVE people have died after a plane crashed into a Direct Factory Outlet (DFO) shopping outlet in Melbourne. 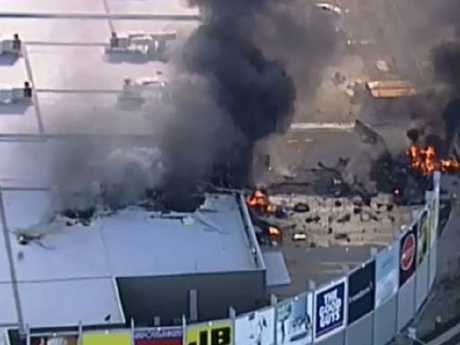 The charter flight smashed into a building at the shopping centre close to the Essendon Airport before crashing in a fiery explosion around 9am on Tuesday morning. There were five people on board. Confirming multiple deaths, Victorian Premier Daniel Andrews said the crash was "the worst civil aviation incident in the state in 30 years". "Today is a desperately sad day," he said. Authorities are yet to confirm details of fatalities including the identity and nationality of who was on the plane. Police assistant commissioner Stephen Leane confirmed only those who were on the flight - four passengers and the pilot - were harmed. "There were five people on the aeroplane. It looks like nobody survived the crash," he said. Essendon Plane Crash: Five believed on board as plane crashes into DFO building. Mr Leane said authorities were in the process of contacting families the victims, and would release further details about those on the plane "as soon as we can". As authorities confirm the death, a chilling frame has been published showing the aircraft in its final moments. The image, part of a video to be broadcast by Network Ten, shows the plane flying low over the shopping centre moments before it nosedived into the building, landing in the complex's carpark. The charter flight was headed to King Island. It has been reported the four passengers were American tourists, headed to the Tasmanian island on a golf trip. The man flying the plane was reportedly an experienced pilot in his 60s. The island sits off the northwestern tip of the state's main island, and has become an attractive destination for golfers, housing the two best public golf courses in the nation, Cape Wickham and Ocean Dunes. It has been reported the group was due to arrive at one of the island's courses on Tuesday morning. A spokeswoman for Cape Wickham Golf Course said all its golfers "have actually turned up for the day", while an Ocean Dunes staff member said there was "no comment to be made". The Beechcraft Super King aircraft was just seconds into its flight when it came in low and fast and hit the complex's homemaker centre at the rear of the shopping centre. It is understood one of the plane's twin engines failed after takeoff with police saying the cause of the crash was likely "catastrophic engine failure". Witnesses reported a loud and fiery explosion as the aircraft crashed into the shopping, and plumes of thick smoke can still be seen coming from the scene. 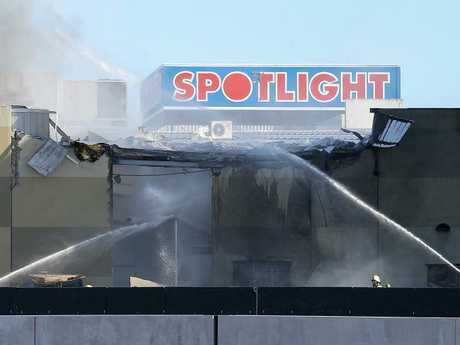 One cafe operator who was inside the DFO complex told news.com.au the crash occurred at the rear of the complex's Spotlight store. Emergency services have closed the shopping centre and are not allowing anyone to enter. A second business owner said she saw the crash from the freeway on her way to work. "I actually saw the explosion. I was coming off the freeway and I saw this huge explosion," she said. "There were flames coming out of the roof and all this black smoke." The business owner said the aircraft did not make it far. She said the crash occurred right near the neighbouring Essendon Airport runway. "They are not letting anyone in at the moment," she said. "I haven't heard anything, so I'm just wondering whether to start up or not." Only skeleton staff were present at the time of the crash as stores were not due to open until 10am. All spotlight staff had been accounted for and police were able to confirm five casualties. DFO has released a statement advising the complex would stay closed following the incident. "DFO Essendon is currently closed, after an incident in which a light plane crashed into the rear of the Homemaker Centre this morning. The Centre was not open at the time," it said. Witnesses have described the horrific scene from the freeway and surrounding roads. "There is constant explosions going off, there is black smoke billowing into the sky," one caller told 3AW on Tuesday. Another witness, Paul, said the scene was "like the vision you see of an atomic bomb". "Just a ball of flame going up in the air," he said. "It was just surreal to see it happening right next to you." ABC radio caller Jason was in a taxi when he looked out the window and saw what he thought was a twin-propeller plane, AAP reports. "I saw this plane coming in really low and fast. It went just behind the barriers so I couldn't see the impact but when it hit the building there was a massive fireball," he told ABC 774. "I could feel the heat through the window of the taxi, and then a wheel, it looked like a plane wheel, bounced on the road and hit the front of the taxi as we were driving along. "We kept driving and there was big fireball behind us." A Channel Nine chopper pilot said the plane made two mayday calls before it went down and that it "cartwheeled" off the roof of the stores. The five-person Beechcraft airport was a charter plane believed to be heading to King Island. Victoria's Police Minister Lisa Neville described the crash as "very tragic accident", and assured a full suite of emergency services were in force following the incident. Ambulance Victoria said in an early statement officers did not yet have details of any injuries caused by the incident, and that the aircraft was not theirs, despite earlier reports. Ambulance and fire crews were responding to the incident. Victoria Police were working to evacuate the area surrounding the crash site and have advised people to avoid the location. During his press conference, the Premier singled out Ambulance Victoria paramedics who responded to the crash. that is not the case. This was a private charter. Nothing to do with the Victorian government or Ambulance Victoria," he said. He also thanked police and 90 firefighters who had done and "equally outstanding job" in what was "a very intense, nasty fire". The Essendon Airport has been closed following the fatal event. 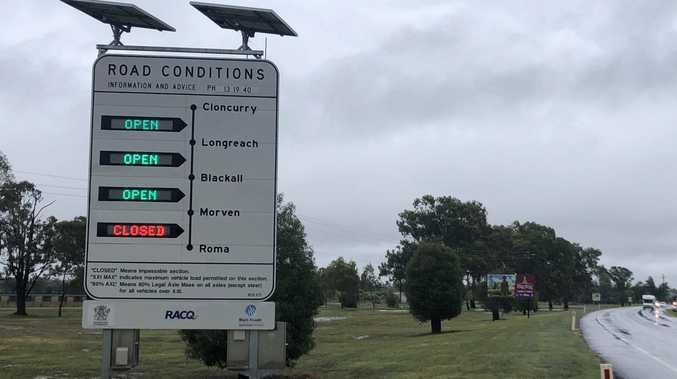 Describing the incident as a "catastrophic event", Victoria's emergency management commissioner Craig Lapsley said it was unknown at this stage how long the airport would be closed. "We are trying to work through now to understand exactly what that means for the number of aircraft that fly in and out of Essendon," he said. Tullamarine Freeway would also remain closed for a number of hours, Mr Lapsley said. While no other people aside from those killed on the plane were seriously injured, Mr lapsley said Ambulance Victoria had dealt with a number of people with concerns about shock and trauma. The Australian Transport Safety Bureau (ATSB) has launched an investigation into the collision. The Bureau said in a statement it had deployed a team of four investigators. "The ATSB has deployed a team of four investigators to the accident site and are expected to arrive on site this afternoon," the statement said. "The investigators will assume responsibility for the secured site, once it has been made safe." The investigation will involve examining the site and wreckage, gathering recorded data including radio and radar, and interviewing witnesses. The pilot's distress call is expected for form a significant part of the investigation, Assistant commissioner Leane said. The ATSB has asked witnesses to contact the bureau on 1800 020 616. EARLIER: FIVE people are feared dead after a plane crashed into a Direct Factory Outlet (DFO) shopping outlet in Melbourne. The aircraft smashed into a building at the shopping centre close to the Essendon Airport before crashing in a fiery explosion around 9am on Tuesday morning. Five people were on board the charter flight, which was headed to King Island. It has been reported the four passengers were American tourists, headed to the Tasmanian island on a golf trip. The man flying the plane was reportedly an experienced pilot in his 60s. The Beechcraft Super King aircraft was just seconds into its flight when it came in low and fast and hit the complex's homemaker centre at the rear of the shopping centre. It is understood one of the plane's twin engines failed after takeoff with police saying the cause of the crash was likely "catastrophic engine failure". Fairfax Media is reporting two bodies have been retrieved from the plane's wreckage and emergency services were searching for three more. Plane hits shops near Essendon Airport: An aircraft is believed to have clipped a building at the DFO shopping outlet before crashing. Plane clips DFO before crashing at Essendon Airport: A small aircraft has reportedly hit a nearby shopping centre before crashing down at the nearby Essendon Airport. Only skeleton staff were present at the time of the crash as stores don't open until 10am. The five-person Beechcraft model was a charter plane believed to be heading to King Island. The aircraft crash has caused significant damage to the building it crashed into. A reporter at the scene described the part of the building where the aircraft hit as completely blackened, and the has left a blackened hole in the DFO building where the roof has caved in addition to other damage. While the fire had been extinguished the smell of smoke and burning materials still hung in the air. The crash has thrown Melbourne traffic into chaos with the Tullamarine Freeway closed in both directions. Debris from the crash scattered along nearby roads has led to extended road closures. A wheel from the plane left on the freeway is believed to have delayed emergency services from reaching the scene. - The Tullamarine Freeway is closed in both directions between English Street and Pascoe Vale Road. - The Calder Freeway is closed in both directions between McNamara Avenue and Pascoe Vale Road. - Bulla Road is closed at the Tullamarine Freeway including the entry ramp to the Tullamarine Freeway inbound. - All access to the Essendon Airport is closed. - VicRoads advises motorists to detour via the Western Ring Road to the West Gate Freeway. - VicRoads advises motorists to detour via Pascoe Vale Road to Buckley Street and through to Milleara Road and Keilor Park Drive, and onto the Western Ring Road.